10% Off Your Purchase at Vapor Beast! 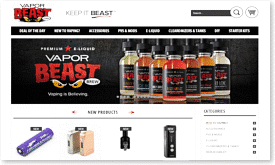 Take 10% off any purchase at Vapor Beast. Quality mods, atomizers, e-juice and more. Expiration unknown. To activate this offer, click the Vapor Beast coupon shown above. A new window will open and take you to the Vapor Beast website. Your discount code will be revealed in the green coupon button shown above. Simply copy and paste the code (or write it down) and apply it during checkout at Vapor Beast.com.